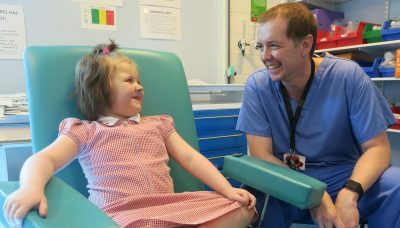 A new piece of equipment used by surgeons and anaesthetists at the Noah’s Ark Children’s Hospital for Wales is helping to revolutionise the care of children with serious and complex conditions. The portable ultrasound machine, funded by supporters like you through our grant programme, allows surgeons to insert catheters carrying vital nutrition and medication straight in to a vein near the heart. The technique, also used at Great Ormond Street Hospital, is so precise that it can even help support the treatment of premature babies weighing less than two kilos. Before the new ultrasound was introduced, the insertion of a central venous catheter involved an open procedure where an incision was made to insert the catheter before being closed up again. It was a method that could cause long term problems for very small babies. Even in older children, there was a risk that the catheter could move and leak, causing irreparable damage to veins. 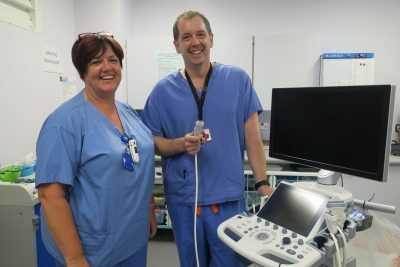 Dr Richard Skone said: “The new ultrasound funded by the Noah’s Ark Charity is very high spec which means we can use it for even the tiniest of babies. The machine helps us to guide the catheter straight in to the vein with a needle so there’s no need to cut the skin. We’re also able to guide the needle and catheter below the collar bone which not only makes it far more effective but is also a lot more comfortable for the patient. Thanks to you, we’ve already supported the Noah’s Ark Children’s Hospital to the value of more than a million already in 2018. As well as fulfilling our ongoing commitment to the play specialist team, your money has helped fund a new pre-surgery admissions unit, the continued delivery of the children’s assessment unit night service and over £258,000 in neonatal equipment as part of our Tiny Lives Appeal. Thanks to you we’ve also handed out close to 100 comfort packs to parents who are admitted to the hospital with their child in an emergency. If you’d like to make a one off donation or set up a regular gift to support our work, click here.